Duvets covers are machine washable and are made with easy-to-close hidden zippers, making it easy to take on and off. Elevate your style and transform your bedroom into a unique style by adding one duvet cover to cart today. With duvet covers, you can transform a room from bleak to bright and cheery in a matter of minutes. Hidden zipper closure is designed to the bottom of the cover, it is convenient to get the duvet in and out of the cover.Corner ties are added to secure your duvet insert or comforter in place. Material is considered environmentally friendly. Due to their thin fabric, it requires less quantity of water for laundering and consume less energy for drying(Cotton takes a lot of water to grow and many pesticides are used to grow cotton that causes serious pollution). Washing machine or by hand. There is no shrinkage and the fabric maintains brightness and shape after washing. If the item has quality problem or you just don't like it, you are covered by our 90 day, no questions asked, money back guarantee. >ATTENTION: 2 Pieces Duvet Cover Set--1 duvet cover / NO duvet insert/ and 1 pillow sham. Single set comes with 1 Duvet Cover(55"x82") and 1 Pillow Sham(20"x26"), Twin set comes with 1 Duvet Cover(69"x86") and 1 Pillow Sham (20"x26"). 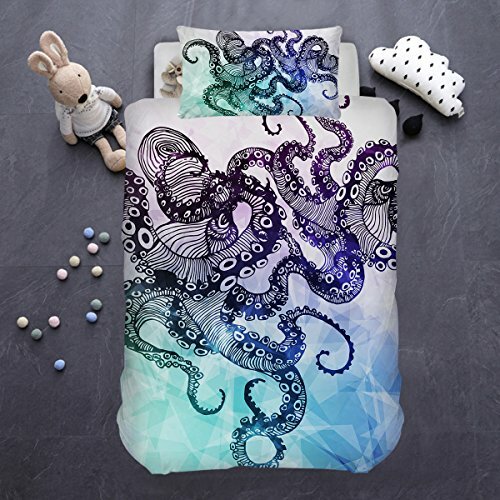 >OCEAN OCTOPUS: The ocean inspired bedding features a vintage drawing of an octopus with curl and swirl tendrils. It's especially great for those who love the underwater and scuba diving.